Leland S. (Sandy) Pierson III is Professor and Head of Plant Pathology & Microbiology at Texas A&M University in College Station, Texas. He received a PhD in Microbiology from Washington State University after completing his Bachelor’s degree in Microbiology from the University of California, Davis. 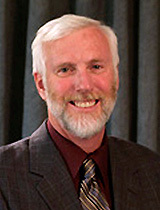 He served as the chair of the Institutional Biosafety Committee at the University of Arizona. He taught Plant Pathology and Microbial Genetics for many years and has served as major professor for thirteen graduate students and served on more than forty graduate student committees. He has also mentored more than forty undergraduates in his laboratory. His research interests include the molecular regulation and multiple roles of microbial secondary metabolites; microbial community signaling and interactions; rhizosphere and speleothem communities; biofilms, and biological control. Pierson, L.S. III, E. A. Pierson. 2010. Metabolism and function of phenazines in bacteria: impacts on the behavior of bacteria in the environment and biotechnological processes. Appl Microbiol Biotechnol.86:1659-1670. Epub 2010 Mar 30. Maddula, V.S., E. A. Pierson, L. S. Pierson III. 2008. Altering the ratio of phenazines in Pseudomonas chlororaphis (aureofaciens) strain 30-84: effects on biofilm formation and pathogen inhibition. J. Bacteriol. 190:2759-66. Pierson, L.S. III, and E. A. Pierson. 2007. Roles of Diffusible Signals in Communication among Plant-Associated Bacteria. Phytopathology 97:227-232. Maddula V. S., Z. Zhang, E. A. Pierson, and L. S. Pierson III. 2006. Quorum Sensing and Phenazines are Required for Biofilm Formation by Pseudomonas aureofaciens Strain 30-84. Microbial Ecol. 52:289-301. Paulsen, I. T., C. Press, J. Ravel, D. Y. Kobayashi, G. S. A. Myers, D. V. Mavrodi, R. T. DeBoy, R. Seshadri, Q. Ren, R. Madupu, R. J. Dodson, A. S. Durkin, L. M. Brinkac, S. C. Daugherty, S. A. Sullivan, M. J. Rosovitz, M. L. Gwinn, L. Zhou, W. C. Nelson, J. Weidman, K. Watkins, K. Tran, H. Khouri, E. A. Pierson, L. S. Pierson III, L. S. Thomashow, and J. E. Loper. 2005. Complete genome sequence of the plant commensal Pseudomonas fluorescens Pf-5: insights into the biological control of plant disease. Nature Biotechnology 23:873-878.